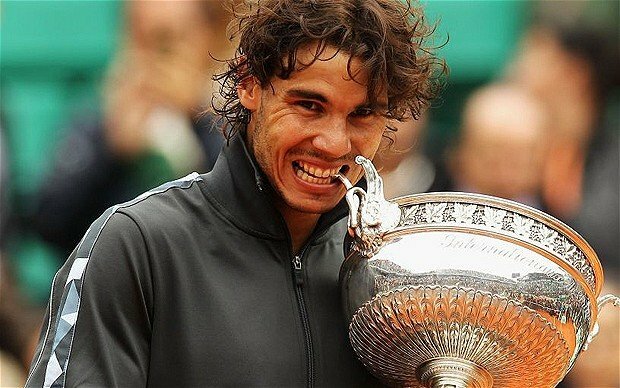 Rafael Nadal had to cope with an on-court intruder and the Paris rain to beat fellow Spaniard David Ferrer and win a record eighth French Open title. Rafael Nadal, 27, came through 6-3, 6-2, 6-3 to reaffirm his dominance on clay, and further elevate himself among the greats of the sport. However, the final was marred by a brief protest high in the stands during the second set that was quickly followed by an intruder leaping onto the court while brandishing a flare. Security guards managed to bundle the man to the ground as he approached Rafael Nadal, and the player even took care to shake an official’s hand before returning to the action. Rafael Nadal immediately dropped his serve, but within an hour he had wrapped up the victory that makes him the first man to win a Grand Slam singles tournament eight times. His 59th match win also takes him past Roger Federer and Guillermo Vilas at Roland Garros, while his 12th major title moves him above Bjorn Borg and Rod Laver on the all-time list. David Ferrer, playing in his first major final at the age of 31, was a worthy adversary and pushed his compatriot harder than the score might suggest, but he never threatened an upset. Both men appeared edgy in the early stages, with breaks of serve exchanged in games three and four, but Rafael Nadal fired a brilliant cross-court backhand winner to move ahead again at 4-3 and took the set with a third break. David Ferrer was making his illustrious compatriot work for his service games and missed an early chance in the second set, before Rafael Nadal made him pay with a forehand winner for 2-0. A routine afternoon looked on the cards, but the calm was shattered by chanting from protesters with a banner in the upper tier of the stands during the sixth game of the set. The players paused while the incident was dealt with only for another, potentially more serious, disturbance to follow before the next game when a shirtless man wearing a mask vaulted the flower bed surrounding the court, waving a burning flare above his head. When play resumed, two unsurprisingly distracted service games followed, but Rafael Nadal moved two sets clear and looked razor sharp again when a volley put him 2-0 ahead in the third. The increasingly heavy rain now appeared the biggest threat to his ambitions, but David Ferrer was not done and got back on level terms before blowing an opportunity to move ahead with a backhand error at 3-3. It was to be David Ferrer’s last chance as a double-fault gave up his serve for the seventh time. Rafael Nadal moved to match point and cracked a magnificent forehand winner before falling back onto the clay in celebration for an incredible eighth time at Roland Garros.